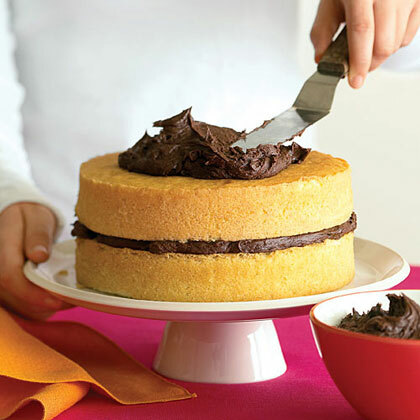 This recipe for buttery layers can be used with a variety of frostings. For an impressive presentation, slice each layer horizontally to make a beautiful four-layer dessert. Preheat oven to 350°. Sift flour, baking powder, and salt into a medium bowl; set aside. In the bowl of a stand mixer, beat sugar and 1/2 cup butter until creamy. Crack eggs into a small dish (do not beat) and add vanilla. Add eggs to the butter mixture 1 at a time, scraping down the inside of the bowl as needed. Beat in flour mixture and milk in alternating batches, starting and ending with the flour and making sure each addition is fully incorporated before adding the next. Butter and flour 2 round 8-in. cake pans. Divide batter evenly between pans. Bake until golden brown and a toothpick inserted in the center of each cake comes out clean, 20 to 25 minutes. Make ahead: Up to 2 days, wrapped in plastic wrap and chilled.